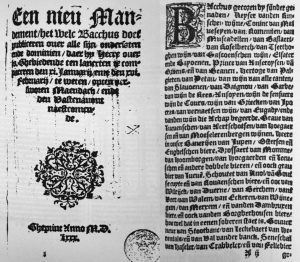 In 1580 an eight-page booklet called ‘Het mandement van Bacchus’ was published, which means ‘Bacchus’ indictment’. 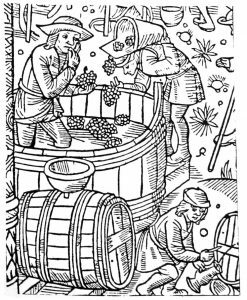 In fact, it was a parody of the language used in judicial subpoenas: in the text Bacchus, lord of wines and beers, summonses his subjects to appear in his courthouses, which are of course his pubs. The charge: drunkenness and staining fox skins, apparently used in pubs against the cold. 32 wines and 30 beers are summed up, in descending order of quality. Also, ‘Bacchus’ mentions 92 pubs, which is only a part of the at least 376 public venues the city knew at that moment. 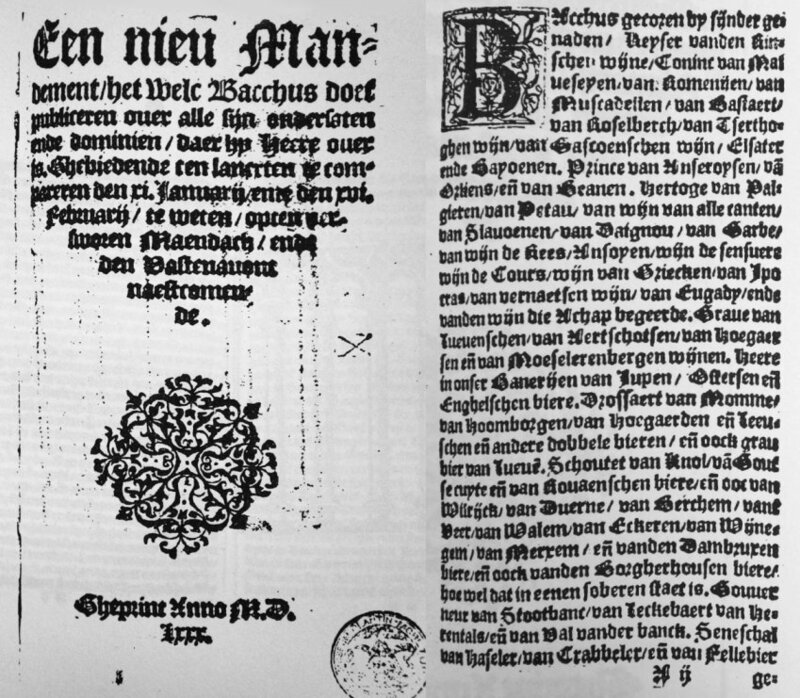 It’s not known who the actual author is, possibly he was one of the furriers mentioned in the text. 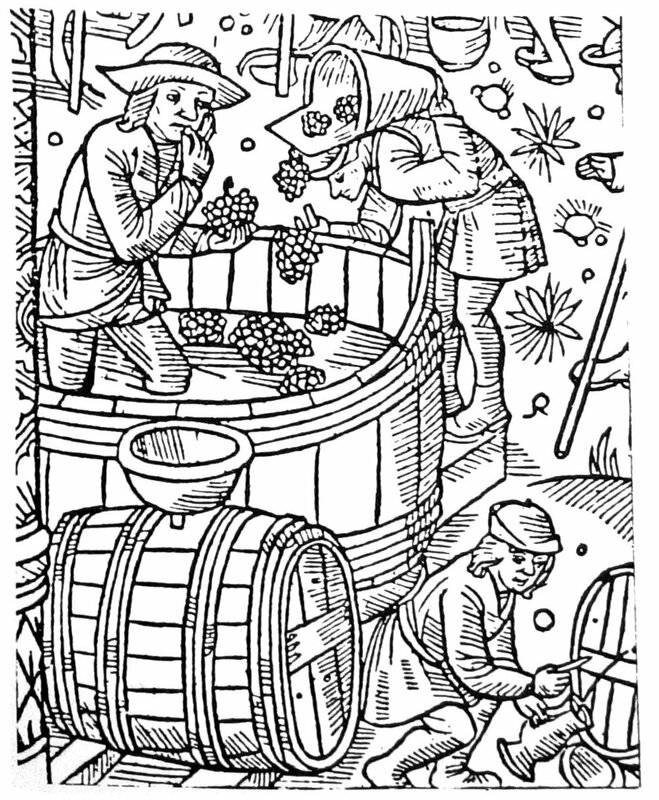 And which wines did the pubs of Antwerp serve? The first to be mentioned are the wines of the Rhine valley in Germany, in those days the most common quality wine in the Low Countries. After all, Germany wasn’t far away. 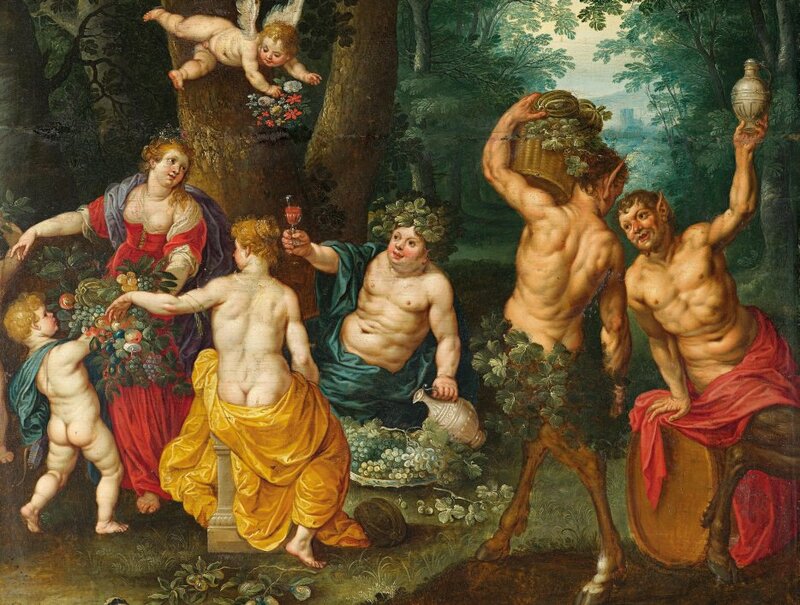 After that, Bacchus sums up a few wines from the Mediterranean: Malveseyen (Malmsey), Romenyen, Muscadellen. These were sweet, liqueur-like wines from the Greek islands. Then follow a great number of French wines from regions like Gascony, Alsace, Anjou, Poitou and Burgundy. Except for the latter, these could easily reach a harbour city like Antwerp by ship. Interestingly, at the bottom of the list a few wines from Brabant are featured: those of Leuven, Aarschot and… Hoegaarden. Because yes, in Southern Brabant a few places now primarily known for their beers were once typical wine towns. By the 16th century, these were already on their way out. Their wines had never been much more than simple country wines, and they were appreciated less and less. High costs, a temporarily colder climate and warfare would eventually wipe these wines off the map for good. Only a few liqueur-like wines, those from Roeselberg hill and ‘Tsertogen wijn’ (‘The duke’s wine’) from Leuven, were to Bacchus’ liking. However, these too would soon be extinct forever. Local beer was doing much better. Bacchus starts his beer list with a few foreign varieties: the thick Jopen beer from Danzig, Eastern beer from Hamburg, English beer and mom from Brunswick. However, these are followed by the beers from Hoegaarden and Leuven, two places that also featured in the list of wines. Their beers, at the time apparently the best to be found in what is now Belgium, were appreciated a lot better than their wines! These were strong beers, just like the beers from Zoutleeuw, or the Knol and double beers from Antwerp itself. Also ‘Goutse cuyte’ is mentioned, one of the last times the kuit beer from Gouda is found as a popular beer in the Southern Netherlands. Also the mention of beer from the French city of Rouen is interesting. Our ‘Bacchus’ goes on to enumerate the beers from the villages around Antwerp: from Wilrijk, Deurne, Berchem, Ekeren, Merksem… This is very probably because there beer, free from city taxes, was a lot cheaper and therefore the people of Antwerp loved to go out of the city to have a cheap beer in the countryside. At the bottom of the list are small and ‘sharp’ beer, weak brews for the poor. Bacchus distances himself from them: he doesn’t want to have anything to do with such inferior beers. Then, there are the 92 pubs mentioned by Bacchus. Paul Verhuyck and Corine Kisling, who studied and annotated the text thoroughly in 1987, have done a brave attempt at identifying them all, with mixed results. Some pubs could not be found in the archives, while of others, like Den Engel (‘The Angel’), there were several. A few were in blocks that by now have been wiped off the map centuries ago during several phases of urban renewal. It all seems so far away, and at the same time it seems like nothing has changed. The inns of those days have been replaced by today’s cafés. 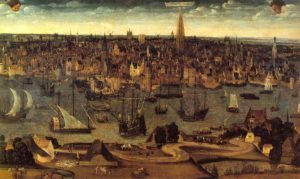 In 1585, five years after Bacchus’ Mandement, Antwerp was conquered by the Spanish, after which the city’s population halved. Antwerp was to face centuries of decay. But today, nightlife still thrives there, from hip mojito bar to sailor’s pub, and during the late hours, you just may cross the devil Moenen there. 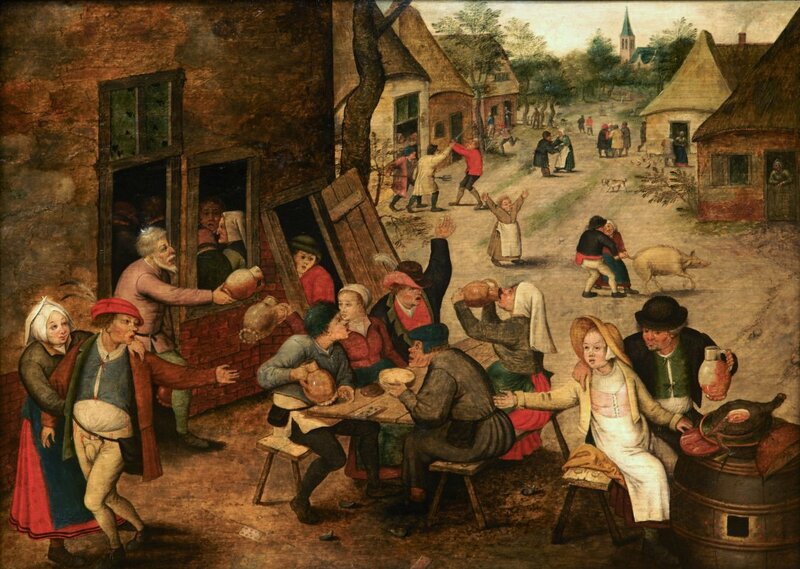 Paul Verhuyck and Corine Kisling, Het Mandement van Bacchus, Antwerpse kroegentocht in 1580, Antwerp 1987.